Flowstopper: Java: .equals() or == on enum values? == breaks type abstraction where equals() does not. See: "Emulate extensible enums with interfaces" Effective Java 2nd Edition. Bloch. p 145. Hello Fabian nice post, If you enum is not extensible then == is better option but as Karl suggested it might not work expected when used with Enum as Type, by the way I have also shared my thoughts on Comparing two Enums in Java. Let me know how do you find it. That way is if the enum value is un/marshalled over a CORBA interface. When it comes back in to your code, the CORBA interface creates a new instance of the Enum class rather than using the existing singleton instance. 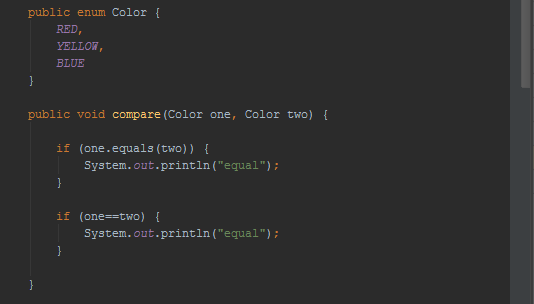 Think about if someone change Color from Enum to class. == will also break the logic without complie time error. So in my opinion == isn't a good solution for everything. In your case, it is a bug due to partial/incomplete refactoring, which is indeed hard to detect. 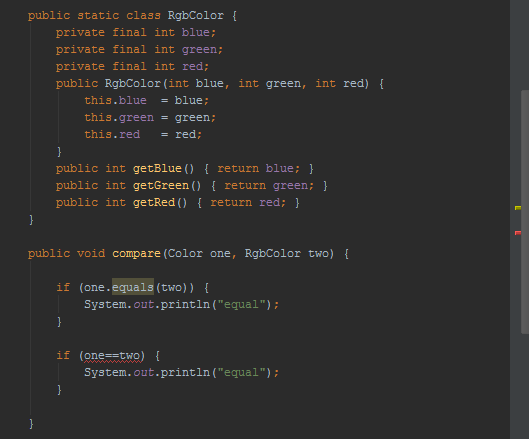 To complete your refactor, I think you can change Color to a "constant holding class"
Then equals() works like a charm.